Helix is a 10″ hybrid model made up of latex, micro-coils, and foam, and it consists of the following layers which are custom configured via altering their densities and weights to achieve the right degree of customization for your sleep preferences. • 2″ Top Comfort Layer – This layer is 2″ of synthetic Dunlop latex designed to provide bounce, cooling, and responsiveness, and it can vary in firmness from ILD 15-32 (ILD being Indention Load Deflection, a measure of firmness) based on the questionnaire answers. 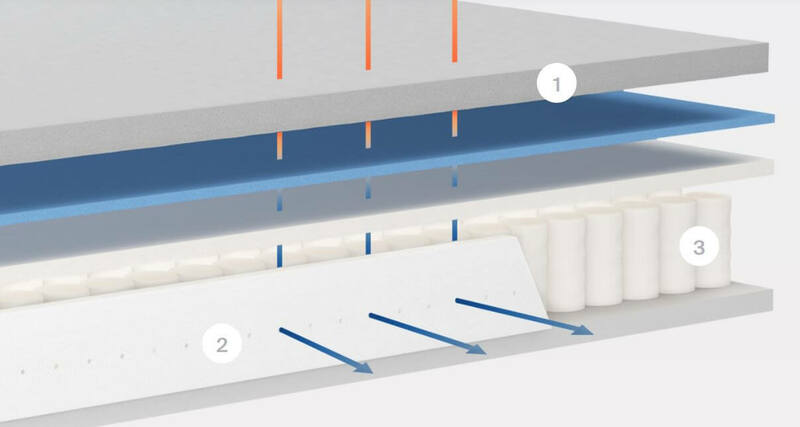 • 2″ Pressure Relief Layer – This layer is 1.5″ of micro coils that provide pressure, relief, bounce, and comfort, and create a similar feel to innerspring mattresses to a small degree. • 2″ Support Layer – This layer is 2″ of polyfoam that provides transitional support between the comfort and lower support layers, as well as deep compression support. It also varies from ILD 20-26 based on the initial sleeper questionnaire. 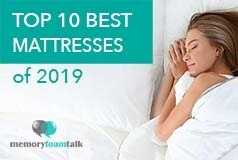 As for myself, I generally prefer a firmer mattress, and my side ended up being firmer without additional support for weight and felt more of a 7 out of 10, with 10 being the firmest. The combination of latex, micro coils, and foam with the soft breathable cover in this mattress all work well together to provide a necessary level of comfort on each side, while the hybrid design of latex and micro coils provides a good degree of bounce and responsiveness. As the Helix is essentially a latex and coil hybrid in the top layers, it provides more of a “sleeping on top of” feel vs. a “sleeping down in” feel that memory foam mattresses offer. 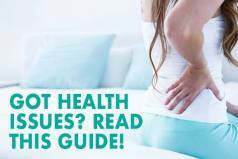 The Helix mattress varies in terms of the amount of sinkage and motion transfer, depending on each side and weight. Adding the “Split Mattress” configuration adds $100 to the price. 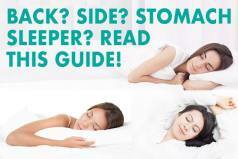 Below is our comprehensive side-by-side comparison of the Tomorrow Sleep vs. Helix mattress. Sharing your bed – The Helix as the blended mattress uses different material construction on each side depending on the individual preferences of the sleepers. Such construction of the mattress isolates the movement and prevents the shaking of the mattress when changing positions with your partner or getting in and out of bed during the night.